Part of my position as a Literacy Specialist is to support teachers and principals at various schools. However, sometimes the requests of teachers provides me with an opportunity to explore some lessons that I have been thinking about and see what works. Often times, I learn as much as the students and teachers learn. Recently, I was invited in to work with a couple of third grade classes and support students in the writing process. I have been wanting to do some lessons with wordless picture books and writing and thought this might be a great time to try it out. I loved how the kids responded to the variety of wordless books. This lesson showed me something important that teachers need to consider when writing with kids. 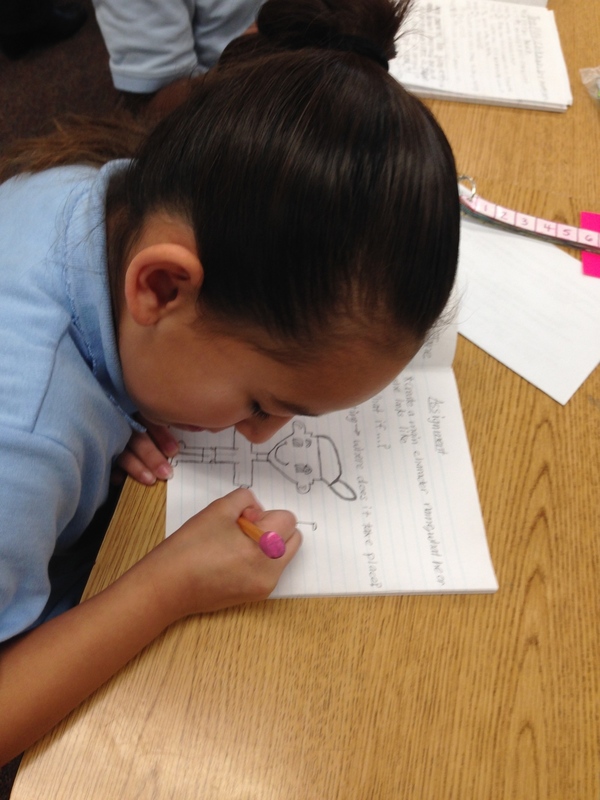 Students need a block of time to work on writing. - Though we want children to have all kinds of writing experiences and to have opportunities to write daily, we also need some extended times to think, explore, and dialogue as well as time to write. I loved watching how students poured over the books and became fully engaged in what they were reading together. There was a general excitement in the room as well as great energy. Students benefit from times of writing together. - For many students, who may struggle with writing, the opportunity to write together allows for ideas and words to often flow a little easier. Collaborating also allows students to feel successful and supported as they share their work. After having some fun with wordless picture books, I realized that there were some things that they needed to understand about the components of a story. I introduced the students to The Plot Chickens. Aside from a fun story, it provided them with an opportunity to think about some of the elements that go into a story. We spent most of the time talking about characters, setting, and plot. For most students, the plot or What if?....is the biggest challenge. They often see a story as telling what the character does in sequential order. Sketching out what a character(s) look like can help them by making their story feel real. Sketching can help students of all levels to organize their thoughts, and creating a story board can help with the details of the story. When something doesn't seem to be working, it might be time to introduce some new information or a new approach. - Though writers' notebooks were good for jotting down ideas, it wasn't great for all of the edits and changes that happen in the early writing of a story. Students loved Little Red Writing and how it helped them as writers to move a little further along in their story's journey. Illustrations, sticky notes & partners help us as writers. - We discovered that storyboarding with sticky notes was a great technique. If we needed to move something around or add or delete something then sticky notes are the easiest way to do it. Discussing stories and telling them to a partner can provide some great feedback. Students have been excited about the extended writing time each week. It has been amazing to watch how students who may not have seen themselves as writers before are developing an identity as a writer and also to watch them collaborating and engaging with one another and learning how to support each other in writing. We still have a lot of learning to do together and there are things to tweak but it's an exciting journey.